A one-day intensive Tea Artisan Training Course based on the Beginners' and Intermediate Tea Artisan certifications conducted by the Ministry of Education and Labour in China. Please contact us for the schedule. Teanamu Chaya Teahouse’s Tea Artisan Training Course is based on the Beginners’ and Intermediate Tea Artisan certifications conducted by the Ministry of Education and Ministry of Labour in China. 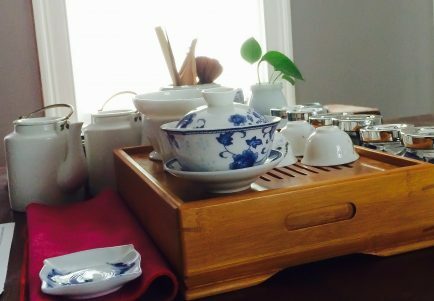 This is a practical based training where participants will learn and practice the two styles of Gongfu tea ritual and will perform a chosen tea ceremony ritual towards the end of the day’s training. Participants are expected to have some experience with the six categories of tea (Greens, Whites, Oolongs, Blacks, Scented and Pu Erhs) although it is not essential. Participants may wish to attend the Tea Lover’s Masterclass prior to signing up to this course. Participants may use non-Chinese tea ritual utensils. For example, small egg cups may be used in place of tea cups and a small milk jug can be used as decanter. Alternatively, all of these utensils can be provided during training or they are available for purchase at Teanamu Chaya Teahouse. At the end of this Tea Artisan Training Course, participants will acquire an understanding of the brief history of tea and will be able to use the Gongfu tea ritual to brew teas from the six main tea categories. The class typically starts at 10am and ends at 4-5pm depending on the progress of the class. This one-day Tea Artisan Training Course costs £180 per person. There is a quorum of 2 participants for this course.